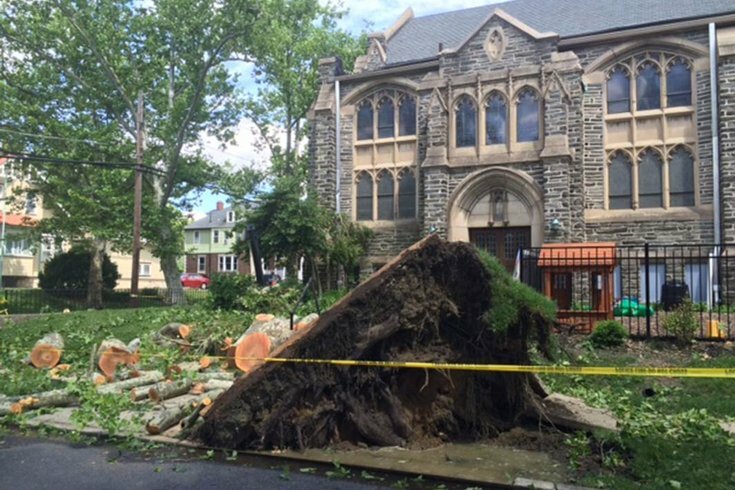 This tree at Maple and Fern avenues in Collingswood was toppled after Wednesday's thunderstorms. Thousands of residents across the region remained without power on Wednesday night after wind-driven thunderstorms brought down trees and electrical lines across a wide swath of the area earlier in the day. At 10:15 p.m., PECO was reporting 321 electrical outages affecting nearly 4,000 customers. The utility had restored tens of thousands of customers who lost power immediately after the storms. At the same time, Atlantic City Electric was still reporting nearly 350 outages affecting more than 5,000 customers in South Jersey. The weather also impacted rail travel in the area. SEPTA's Regional Rail service was immediately suspended due to downed wires on two lines: Chestnut Hill West and Trenton. Trains on the Trenton line were running again within hours, while Chestnut Hill West trains resumed right around the evening rush hour. Trains on the Chestnut Hill East line were running on a single track due to downed trees. New Jersey Transit also suspended River LINE service in both directions for a time between the Pennsauken Transit Center and Rt. 73 after a downed tree blocked the tracks. The Philadelphia International Airport also reported delays. Earlier in the day, National Weather Service forecasters had predicted conditions favorable for storms, strong winds and the possibility of small hail. Winds of 45 mph were reported in some parts of South Jersey. 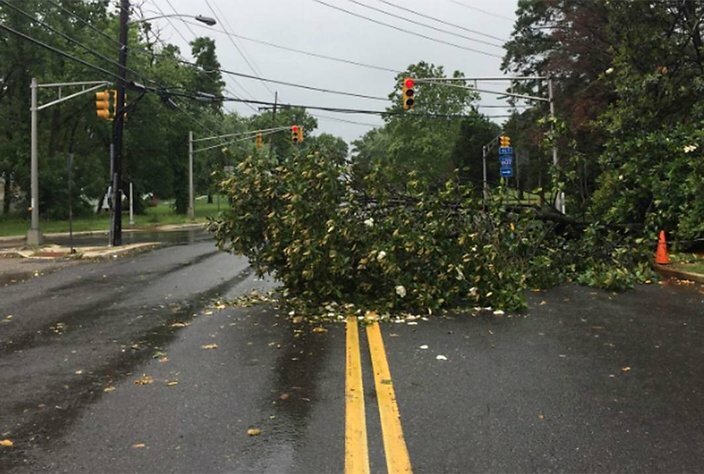 The Moorestown Police Department in Burlington County tweeted out this photo of a tree down on South Church Street between Fellowship Road and Route 38, the result of thunderstorms and damaging winds that raced through the region Wednesday.